Do you know an individual or organization who has made an important contribution in the lives of people who are blind and visually impaired in Wisconsin? 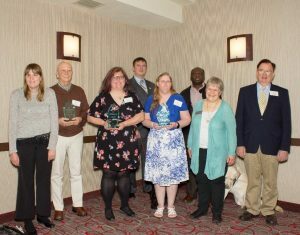 Consider nominating them for a Wisconsin Council of the Blind & Visually Impaired Excellence Award. Click here to download the nomination kit. Last year the Council was privileged to honor four talented and committed people, who’ve dedicated time, talent and creativity to this endeavor. BJ Blahnik, a bronze medal winner in Blind Sailing International’s world championships, who worked with SEAS, a sailing program for the visually impaired in Sheboygan, to bring a sailing instructional simulator to Wisconsin. The simulator can be brought around the state and last year, attendees at the Lions Camp for Adults with Vision Loss were able to give it a try. Danny Cornelius and Lois Miller, who have long histories of running vibrant low vision support groups, which are often a life-line for those experiencing vision loss. Lois worked with the ADRC of Richland County for 30 years and Danny volunteered in his community of Manitowoc for over 40 years. Julie Hapeman, an orientation and mobility specialist with the Milwaukee Public Schools, who organizes an annual White Cane Day Flash Mob of student dancers, incorporating their white canes into the dance. Julie’s efforts also help fundraise for the Council’s White Cane Fund, which distributes free white canes to any Wisconsin resident who is visually impaired or blind. If these stories inspire you, please consider nominating someone who deserves recognition for their efforts. Applications are due by Friday, April 19. Recipients and their nominators are invited to join us for the Council’s annual Scholarship and Awards luncheon in Madison on Saturday, May 18. Please reach out with any questions and send completed applications to Denise at djess@wcblind.org.